Shimoga district is at the banks of river Tunga. 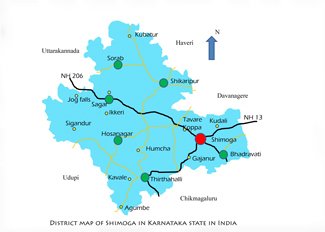 Shimoga town is at a distance of 280Kms from Bengaluru (Karnataka State Capital). 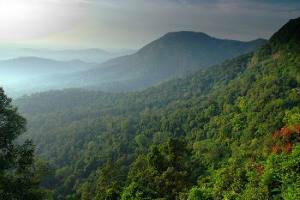 Residing at Malnad area (meaning, hill area), the district has many green valleys. There is an old fort and some old monuments and temples in the city. 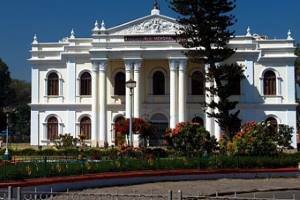 There is an old palace having museum with the history of the dynasty (ruled by Shivappa Nayaka) and several ancient sculptures. 125 years old Sacred Heart Cathedral which is considered as the monument can also be seen here. The first in the list of visiting places in and around Shimoga is the World famous Jog water falls (highest water falls in India - 292mtrs). 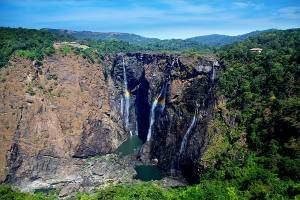 Jog falls is nearly 100 kms to the North-West of Shimoga town (almost at the border between Shimoga and Uttar Kannad districts). Sagar is 75Kms from Shimoga. 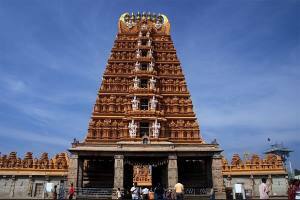 Marikamba temple, Samadhi of Sridhara swamy at Varadahalli are important places to visit. Sagar has recognition as the best Sandal wood carving centre in Malnad region. One of the peak point in western ghats, 825mts from sea level, is famous for sunset view. Agumbe is 90 Kms away from Shimoga town towards South-West. Famous for Visweswaraya Iron and Steel company (VISL under Steel Authority of India (SAIL) Limited) and Mysore paper Mills. Located at a distance of just 10Kms. The town is located on the banks of Bhadra river. A famous Jain Pilgrim centre. Located at a distance of 60Kms. Padmavati Devi temple, Lucky tree, Panchakuta Basadi with Mahavira Tirthankara images are important visiting places. Very nearer to Sagar (2-3 Kms) this place was once the capital of Keladi Nayakas. Aghoreshwara temple with a huge Nandi statue are worth visiting. Gajanur dam on river Tunga is a picnic spot. Located 10Kms from Shimoga. Three is a facility to stay in the forest lodge. This is an Elephant training centre. This is an historical place located at a distance of 5Kms from Sagar. Rameshwara and Veerabhadra temples (built by Keladi Nayakas), museum are main tourist interests. This place also has importance with Rani Chennammaji (one among two queens) and Keladi dynasty which had 16 Kings. The main place of interest is the huge pond called Pushkarini. There is a building at the center of the pond with structures whose architecture resemble both Hindu and Muslim. Sante bennur has a long history with Palegars and is located at a distance of 50Kms. This place is well known for the reason that the main language spoken here is Sanskrit (entire India). All the families speak Sanskrit. Situated at the banks of river Tunga, Mattur is 10Kms from Shimoga. There is a Sanskrit college in this village run with Gurukula system. Kaitabeswara (Shiva) temple, 65Kms from Shimoga. 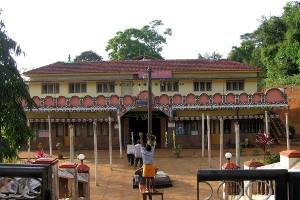 Sigandur chaudamma temple is also a famous temple located near Sharavathi river in the back water of Jog falls. Click the map above to see all the visiting places, their location and road connectivity in Shimoga district. You will get frequent busses from shimoga, and all the busses that are going towards jog will go via sagar. @prasenjit: the bus fare from shimoga to sagar is around 45rs and shimoga to jog is around 60 rs. I want to catch a bus from shimoga to reach jog fall.so for that i checked ksrtc and didn't find buses over there to book tickets . 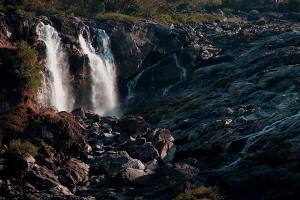 are there sufficient frequency of buses from shimoga to jog falls ? I am from Murudeshwara. My family is thinking of visiting following places. Can we visit all these places in a single day?? we will hire a car to avoid transport problem. The Nearest railway station is Talaguppa railway station and its better you get down in Sagara railway station ( railway station prior to Talaguppa) for better transport/Hotel availability.